If you don’t have the Sodaq boards installed follow the steps here. The SODAQ ONE has everything on board to be the perfect tracker. The latest tracker software can be downloaded from our github. Opening the .ino file should open the Arduino IDE. Select the correct Board and Port* and upload the sketch. *Note: if you don’t see a port the Sodaq One is maybe in sleep. 1x reset the board will normal reset, tracker code has 30 seconds before it disconnects the usb. 2x reset in a second will manually put the Sodaq One into bootloader mode. After compiling the sourcecode and loading it onto the board you will be able to configure the board through a menu. After compiling the source code and uploading it to the board you will be able to configure the board through a menu. Will set the time between the GPS fixes to 5 minutes. Setting fi=0 will disable the default fix interval. After the startup the device by default willt be in deep sleep mode. In sleep it uses less than 50 uA. Using the RTC Timers it will wake up at the set intervals. The application is based on the RTCTimer library. At startup the application tries to obtain a GPS fix until timeout. If no fix can be obtained initially the location will be set to 0,0. Once the first fix is obtained the RTC will be set and that fix location will be kept until the next proper fix. As seen in the configuration menu we allow for two different schedules for GPS fixes based on UTC time. The default could for instance be that we want a GPS fix every 30 minutes during the night, but during the day we want a fix every 5 minutes. In that case we configure the default to be 30 minutes, but the optional fix timer to be 5 minutes from 06:00 UTC to 18:00 UTC. The RTC library allows for two of such timers. In case the second Fix interval is set to 0 the second timer is simply ignored. After a GPS fix is obtained with at least ‘Minimum sat count’ satellites (or the timeout reached) a LoRa packet will be sent. In case of timeout without obtaining enough satellites, the best GPS fix found (if any) is used. For redundancy we could configure a repeat count. The value of the repeat count tells us to send the Lora frame an additional number of times (default 0) for redundancy. The Lora frame contains the following data. The minimum frame size is 21 bytes, the maximum frame size 51 bytes, depending on the number of coordinates we have configured to be sent. 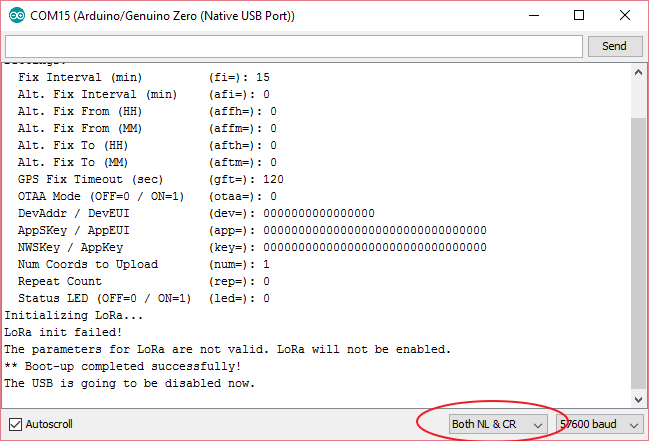 The LoRa communication only starts if the keys are not 0 (0 is the default) If ‘Retry conn.’ is on, then in case the connection to the network is not successful (useful for OTAA), the application will retry to connect the next time there is a pending transmission. The on-board accelerometer provides temperature delta with 1 degree Celsius resolution. It is not factory calibrated so the offset needs to be set in the application (command “temp” or it can be hardcoded in the code) for each board. The firmware supports, except for the default and alternative fix intervals, a third fix interval that is dependent to movement: if the acceleration on any axis goes over (or below in the case of a negative axis) the acceleration set in Acceleration% parameter for over the set duration, the on-the-move fix interval becomes active until “Timeout” minutes have passed since the last movement detected. Copyright (c) 2016, SODAQ All rights reserved. When you enable the status led, the led shows you shen the sodaq one is active. Green after bootup: GPS fix and succesful lora transmission. Blue: Fix Interal (fi=15) On while its getting a GPS fix and doing the transmission of the data, has a timeout of 120 sec(gft=120) by default. Send a downlink message to the device to update the settings. Al values need to converted to hex, adjusted to correct lenght and converted to little endian. OTAA Config record is not valid! If you don’t see these messages there might be an firewall issue on the gateway. Queue issue on the server side. Or range to long to send a message to the node.